Miguel Sanchez was raised in the sunny state of California. 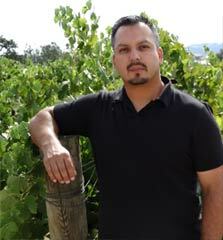 As a young adult he spent his summers working in the Monterey county vineyards. He had a brief summer job at Kendall Jackson winery and later joined Blackstone winery as a Laboratory Technician where he solidified his aspiration to become a Winemaker. He graduated from California State University Fresno with a degree in Enology in 2008, while working for Paul Masson winery. His education has propelled his career, and his experience is now broad, and ranges from premium red and white wines, delicious Ports and dessert wines, Sparkling wines, and a broad range of import wines from Australia, Argentina, Chile, New Zealand, South Africa, France and Spain. Miguel is very passionate about California wines, and is proud to be the winemaker at Cook's California Champagne Cellars.